Art Basel Miami annually attracts thousands of artists, collectors, art critics and the public to an arts fair that is international in scope. Visitors come from Africa, the Americas, Asia and Europe. On the surface this year’s Art Basel Miami seemed inclusive; diversity and social justice art themes were prevalent and the crowds of people at the Miami Convention Center spoke several languages and looked like a UN gathering. 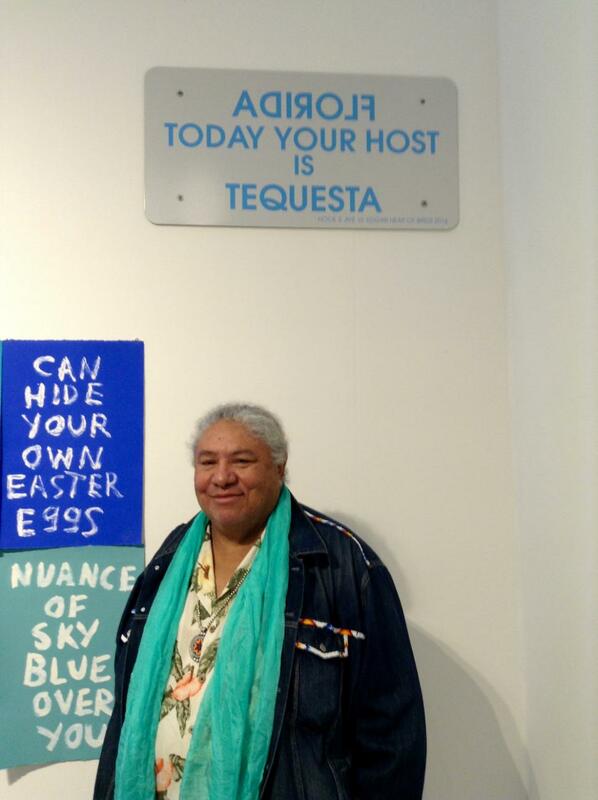 But despite this rainbow appearance, only two American Indian artists exhibited this year; Edgar Heap of Birds (Cheyenne/ Arapaho) at the satellite venue PULSE, and Gina Adams (Ojibwe), represented by Accola Gallery at the CONTEXT satellite location. 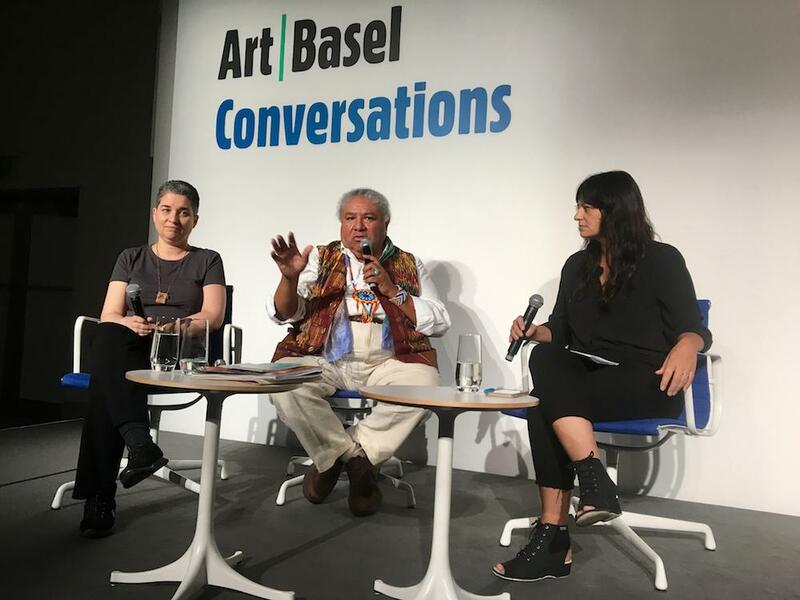 This relative absence of Native artists provoked a lively discussion at one panel of Art Basel Conversations, held in Miami’s Botanical Garden. Heap of Birds himself grappled with the issue, along with Kathleen Ash-Milby (Navajo) associate curator at the National Museum of the American Indian. Albuquerque-based writer and curator Candice Hopkins (Tlingit) served as moderator. With his charismatic presence and strong commanding voice, Heap of Birds listed a series of barriers to entry at the major international art exhibitions. He spoke with authority as an exhibitor at the famed Venice Art Biennale in 2007 and other major fairs, such as Documenta in Kassel, Germany, and the Whitney Biennial in New York. Venice, he said, requires artists to submit a proposal that must be approved by a committee. “It is like the Olympics for artists, and countries are not always neutral in their selection process.” Censorship, depending on the particular United States administration in power can sometimes be an issue. Art Basel in Miami poses additional difficulty, said Heap of Birds, because it is “more commercial, not as driven by culture as some of the other international art fairs.” It cost about $30,000 for galleries to participate. The Indigenous art situation in Canada offered a welcome contrast, said Hopkins and Ash-Milby. They related how First Nations artist and curator Gerald McMaster (Cree) was instrumental in changing the acquisition practices of Canadian institutions, encouraging them to focus not just on Native artifacts but also on contemporary art. They cited Canadian curator Jean Fisher's exhibition We the People as an example of contemporary Native art shown in mainstream art venues. Heap of Birds later mentioned Brian Jungen (Dane-Zaa) and Edward Poitras (Metis), the first Canadian Indigenous artist to be in a Venice Biennale (1995), as contemporary Indigenous artists who are part of the international art market. He encouraged Native art students to study the full gamut of contemporary art and not always think about exclusion. “They must be creative instead of being upset because they are not included. No one gives us an entree. You have to take that position.” He urged Native artists to attend the various international art fairs. “I move around this earth, and I am influenced by violence, aggressiveness, sensitivity and sexuality. We artists are expressive people; we learn from each other,” he said. 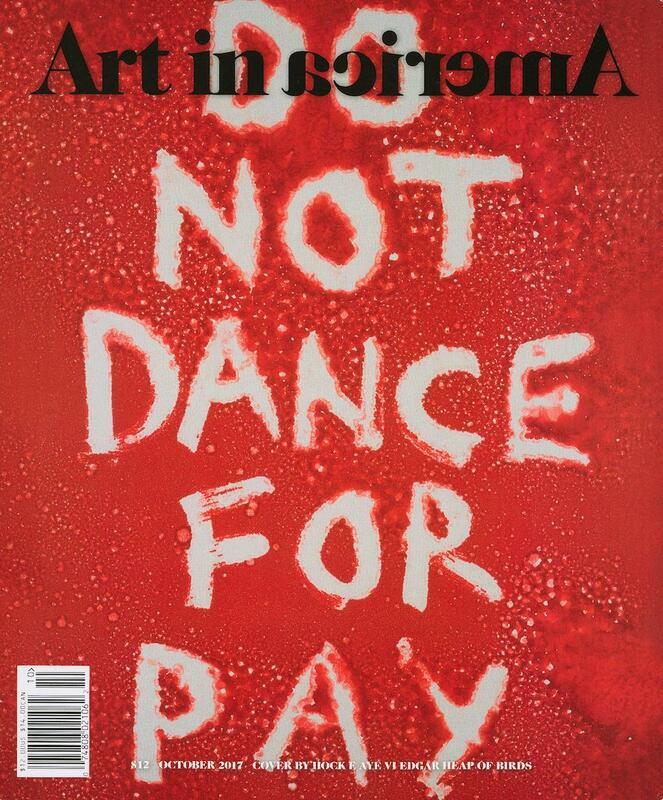 This theme rebounded as a counterpoint to concerns about Native artists in the global art market. As Ash-Milby observed, “this is LEFT: Edgar Heap of Birds at his PULSE exhibit, a satellite to the Art Basel Miami international art fair. Overhead is an “honoring sign” made for an earlier event to recognize the Indigenous tribes of southern Florida. BELOW: Cover of Art in America magazine (October 2017), featuring the work of Edgar Heap of Birds. Used with permission. just one path an artist can take.” Heap of Birds warned that some Native artists are missing the ideas of spiritual guidance and the renewal of land for the people. He challenged them not only to make and sell art but also to learn songs from the elders, to sing and pay their dues because they too will become elders one day. In conjunction with Art Basel Miami, Edgar Heap of Birds exhibited his installation Nuance of the Sky at the satellite art fair PULSE Miami Beach, located ironically at Indian Beach Park. 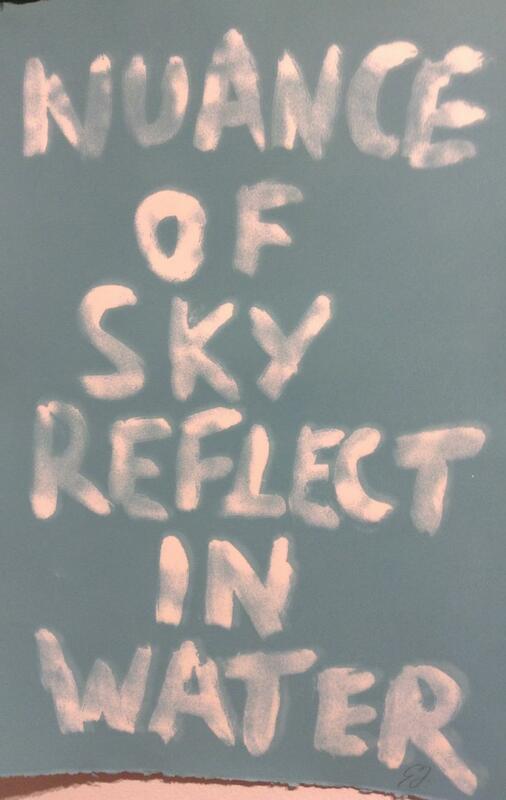 The 16 poetic statements from the Nuance of the Sky series are laid out in a rectangular format with eight on the top and bottom on 120 x 44" ink on rag papers. The statements deal with injustices, stereotypes and current perceptions of American Indians. 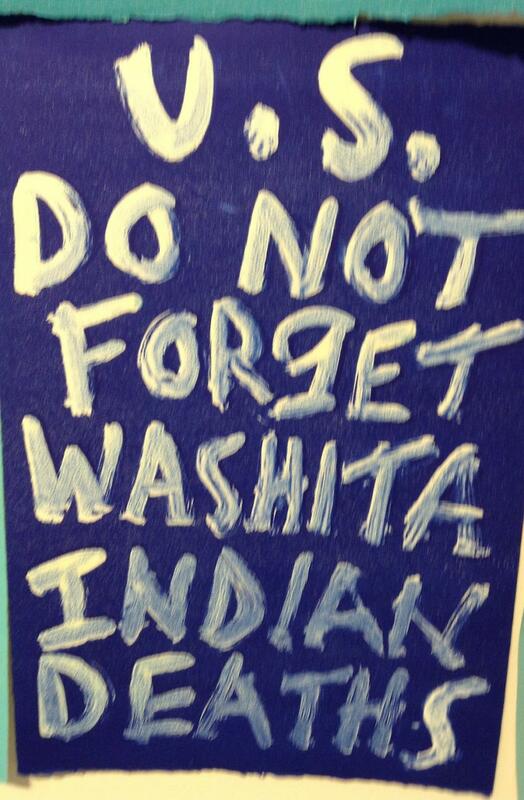 Some are very specific such as U.S. Do Not Forget Washita Indian Deaths. (This image references the 1868 Washita Massacre when George Custer’s 7th Calvary attacked the Southern Cheyenne, killing mainly women and children.) Other texts such as U.S. 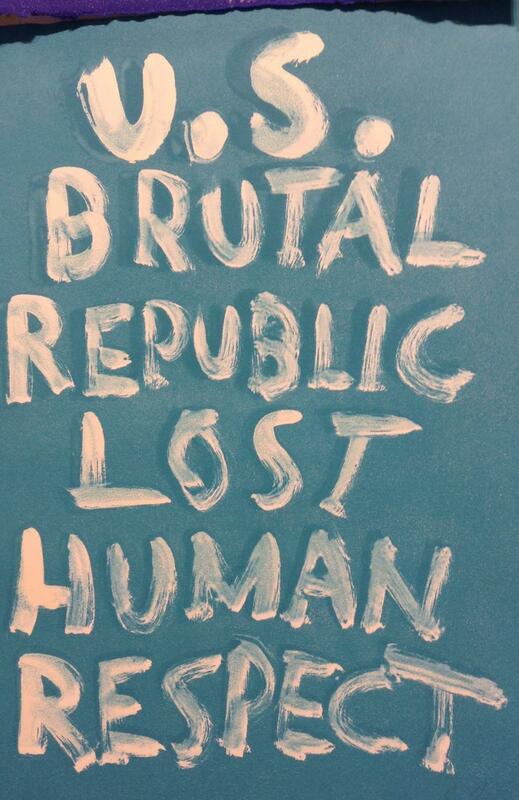 Brutal Republic Lost Human Respect can be interpreted as applying to injustice on a broader scale. Nuance of Sky Reflect in Water and Blowin Down South The Warm Air may remind viewers of environmental concerns such as climate change and water pollution. Before the opening of his exhibit, Heap of Birds staged an intervention in Key West, Fla., to honor four Indian tribes indigenous to the state. At PULSE, he brought his “honoring sign” for the Indians of what is now Miami, part of his Native Hosts project. 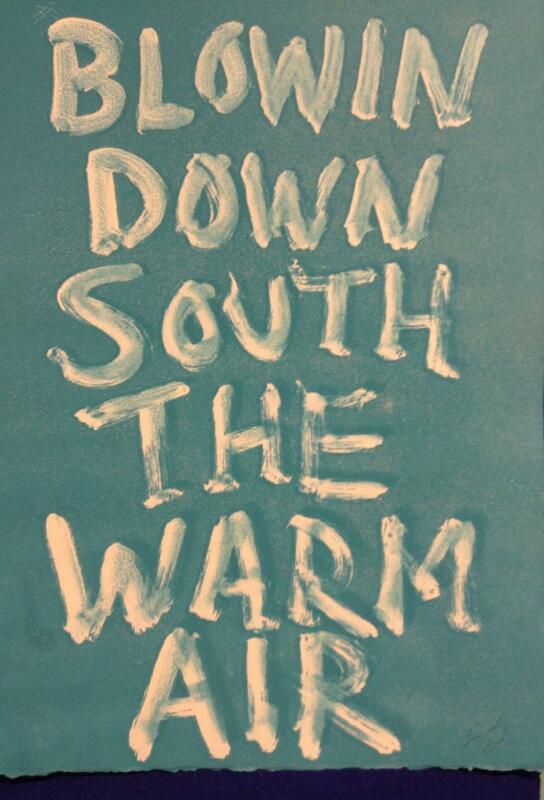 On the gallery wall above his poetic series he hung, (Florida, spelled backward) Today Your Host is Tequesta. The one other Native artist at the event was Gina Adams (Ojibwe), exhibiting in a satellite show, CONTEXT Art Miami, located on Biscayne Bay. It included Treaty With the Cherokee 1794 from her Broken Treaty Quilts series and her cross media oil and encaustic nine-inch round ceramic basketball shaped sculptures from her Honoring Modern Unidentified series. The distance of satellite fairs from the Miami Convention Center was a factor in limiting visitors’ access, as was the additional admission cost for satellite fairs. Since all the major news outlets were positioned at the Convention Center, media attention was also probably limited.